Written for and printed first by City Social Magazine. View the issue here. Baton Rouge during the fall means local college campuses are taken over by tents, RVs, grills and yard games. The smell of southern Louisiana fare fills the air, and if you’re lucky, fellow tailgaters will invite you to make a plate and wash it down with a beer. But you won’t find just your typical burgers and hot dogs here. Tailgates down south do it differently and the menu is the most important aspect of the day – other than the game, of course. This treat is an appetizer with no need for dipping sauce. Link-style or fried into a ball, boudin is filled with pork, rice, seasonings, onions and peppers. It packs a flavorful punch and is a must-try in Baton Rouge. The “Jambalaya Capital of the World” is just south of Baton Rouge, so it’s no wonder you’ll find people tending to a black, cast-iron pot for hours to get this dish just right to feed the masses. You may also discover pastalaya while tailgating – a version of jambalaya where pasta replaces the rice. It isn’t an odd sight to see tailgaters cooking up some of the opposing team’s mascot for intimidation. 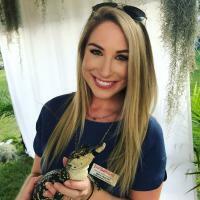 Whether they’re playing the hogs and having a cochon de lait, or grillin’ up some gator meat, fans are known for making their loyalties known in this manner. Shrimp, alligator, catfish filets, hush puppies, crawfish, Oreos – you name it. If you can batter it, they’ll fry it. Last but not least, the corn dog – an item that can’t go without being mentioned here. Due to some untraceable reason, LSU’s campus is associated with the smell of corn dogs. But hey, who doesn’t love a good corn dog?! 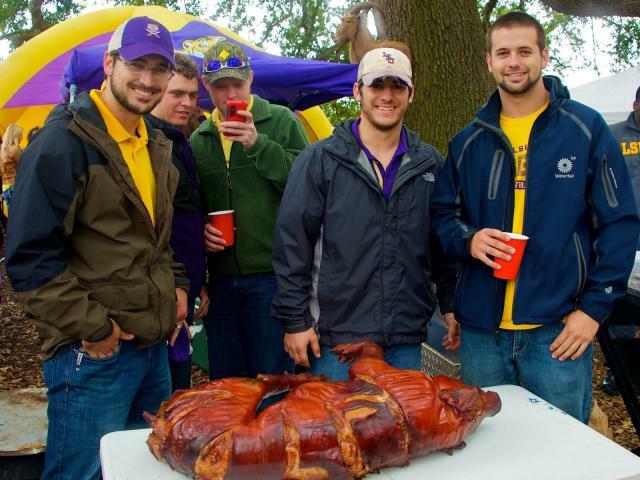 Invite your friends and family down this football season to get a true taste of Louisiana through these Baton Rouge tailgate favorites!